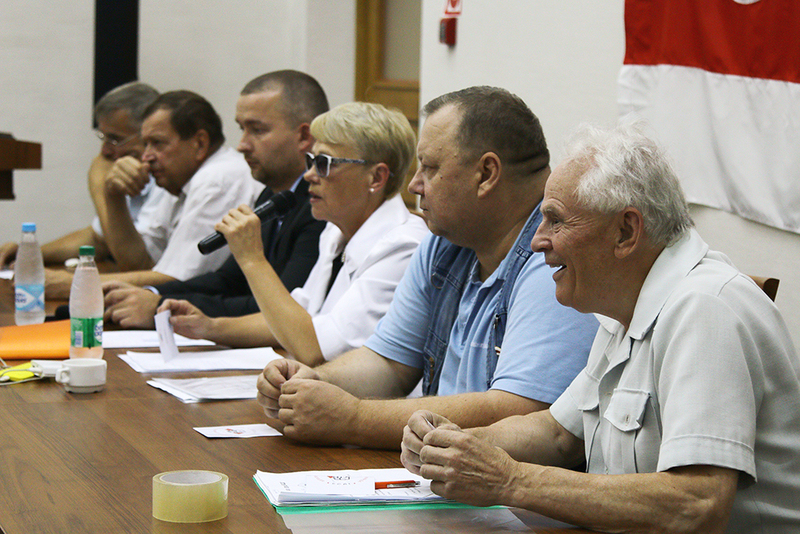 September 9, took place the 7th congress of Belarusian Social Democratic Hramada in Minsk. 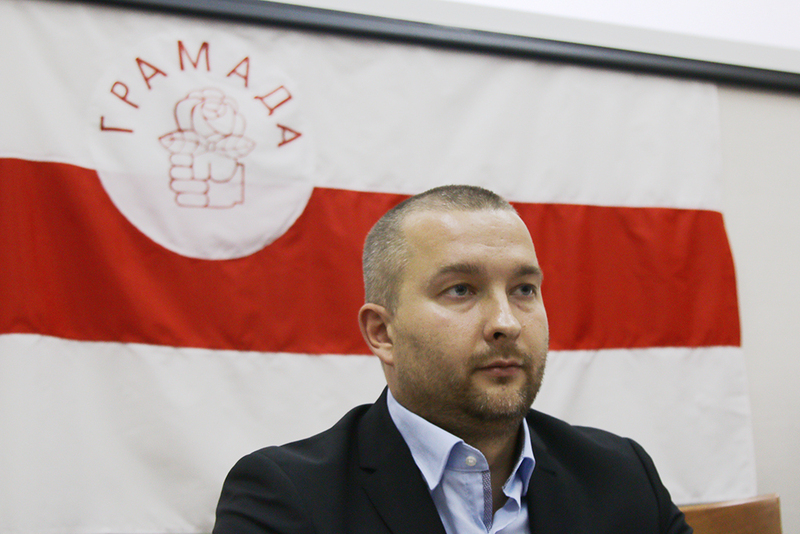 Recently the chairman of party Stanislav Shushkevich has announced that he stepped down the post. But the congress took a decision that it is not correct to choose a new leader without the chairman, who got into hospital, reports Radio «Svaboda». 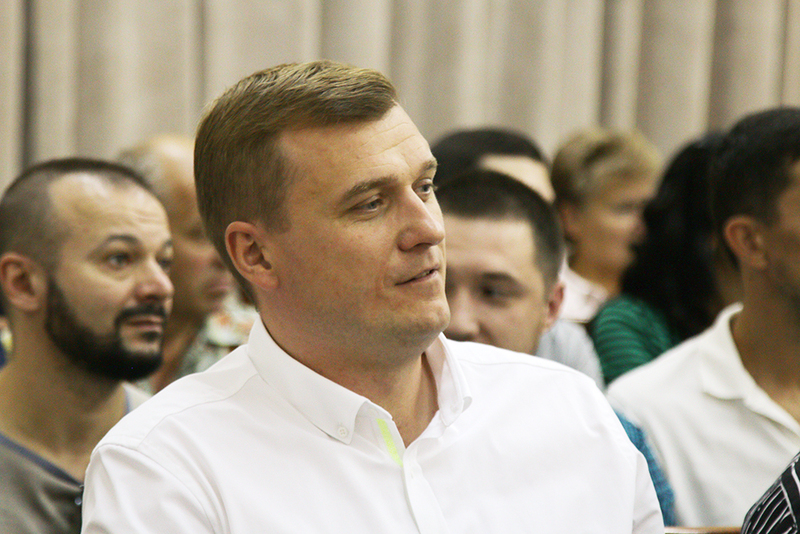 On the congress one of vice-chairmen was marked out by an active position, it was 33-year old Sergey Cherechen. In the very beginning of congress he offered to change party symbolics, having removed a fist from the logotype, that holds the symbol of social-democrats – a rose. Then he offered to add the main guidelines into the work of the party. In BSDH some people suppose that he exactly that person who can head the party after Shushkevich. Sergey Cherechen – is a director of OJSC «Montazh Tehnika». Born in Mogilev. Graduated from Belarusian State University of Informatics and Radioelectronics. During studentship he managed several projects and was involved into business. In 2016 he tried to stand as a candidate in the House of Representatives by 108th Kalinovskiy district of the capital. However, the regional election committee declined him in registration, referring to the fact that 32,1% of signatures for his forwarding were invalid. In summer of 2016, he stood as a candidate for deputy, was a member of Communist party in Belarus. Left CPB by his own free will, at the end of 2017 he joined BSDH and soon was elected as vice-chairman. —Sergey, did you expect such development of events during the congress – adjourning of election a party leader and his vice-chairman on the second session of congress? Did you negotiate that with the leader of BSDH Stanislav Shushkevich? —We made this decision collegially during the congress, because we all have great respect towards the leader of our party and it would be wrong to hold on elections without his participation. —But the day before the congress, just in Friday, Shushkevich gave an interview from hospital and told Mass Media that he is tired and referring to his old age he is ready to leave the post. —We have been discussing this issue with Stanislav Stanislavovich long time. But the decision to adjourn the election was made only on congress in September, 9. —Sergey, you are a businessman, but to be more exact with a focus on politics: you already have been trying to stand as a candidate for deputies in the House of Representatives, now you are vice-chairman of BSDH. We all know a lot of sad examples when businessmen turned into politics and had problems with business. You afraid that this can destroy your business, aren’t you? —It would be strange if I were not afraid…But, first of all, I live in this country and I’m not going to leave my country, I understand that my children will live here and I don’t want them to leave as well. That is why I want to do my best and give something good to the country. Working exactly in the sphere of politics, I realize that I can do enough good and proper things to my country. Yes, I understand that can rise up problems; maybe misunderstanding, maybe pressing. But until you try — you will never know. I’m a risky man. — Yes, I really was a member of the CPB, and I joined the party consciously. But after a short period of time I was disappointed. In the Communist Party of Belarus, all the initiatives that I offered were broken up against a wall of misunderstanding. Therefore, I decided to leave CPB and apply my knowledge, capabilities and desires in different political structure. The BSDH party is exactly the structure where I can use my potential. I left the CPB few weeks before the last elections for local council seats. I wrote an application about the withdrawal from CPB. —But in Belarus there are three social-democratic parties: BSDH, BSDP «NH» and BSDP. Why did you choose exactly BSDH? —Undoubtedly I chose it because of its leader. Stanislav Shushkevich — is a respected person, I was pleased to meet him and work together. It is a great honor to work with such a historical figure. That is why, first of all, my choice was determined precisely by the personality of the leader, honest, responsible, with an inner core, who has been always working on his country. —You said that you left CPB few weeks before the last elections for local council seats (elections were recently – February 18, 2018) – you became vice-chairman of the party? Why has everything happened so quickly? —By the fact of activity, by the fact of proposals, initiatives. I have a good portfolio, Stanislav Stanislavovich proposed me as a candidate of the post of vice-chairman of the party on the last meeting of the Central Council. —How to move people who are suspicious towards the opposition? What creative ideas do you offer? —On the congress of BSDH I made a report with my vision of the main guidelines in work. There are several of them: increase of share presence on the informational, political and social arenas of the country; popularization and «branding» of BSDH party program, both as among young people and the elder generation; increase of «recognition» level of the party leadership and loyalty of the population; creation of a cohesive team all over the country. I completely share the opinion that selective protest movements, unsupported by the majority of the society, have a negative impact on the image and the status of the opposition. Only constructive actions, only proposals of constructive solutions in complex and simple problems will help to change the status and image of the opposition. Now we must work on the image of the party, arise interest of our citizens, show what we are capable of and that we do it not just for the «show», but we do this, as it can be seen in our slogan, «with love» to our homeland, to the citizens who live in this country. Protest movements, marches, opposition meetings — all this is necessary to express one's opinion. But along with all these activities, should be applied constructive body «movements», actions, something good, positive. We must show Belarusians that we want to not just conflict or be in confrontation, but we want to offer something and insist that our constructive proposals were implemented. —Tell at least one constructive offer. — Please read our program. —What is the first event that BSDH will spend? —We will hold a meeting of the Central Rada and will prepare for the second session of the congress, where we will elect the leadership. —You speak Russian, your offers by the guidelines of activity are also written in Russian. Don’t you think that there is a dissonance, as Stanislav Shushkevich, the chairman and symbol of the BSDH party, is basically a Belarusian-speaking person? —I understand the Belarusian language perfectly, but I do not have language practice. If I start speaking Belarusian, I will have many mistakes. Therefore, trasyanka is not welcomed in the society. I will definitely «catch up» the Belarusian language, and if I more or less succeed, I will turn to Belarusian. All people of my age understand it, want speak it, but without active language practice it's hard. 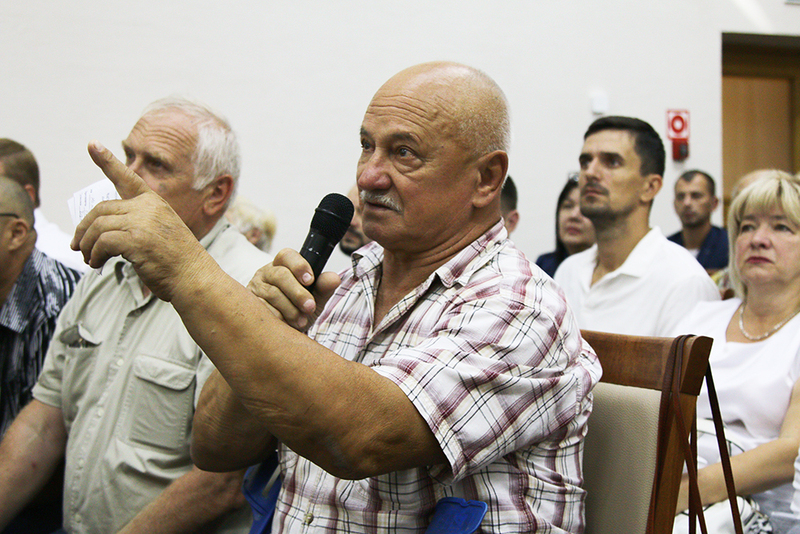 September 9, took place the 7th congress of Belarusian Social Democratic Hramada in Minsk. 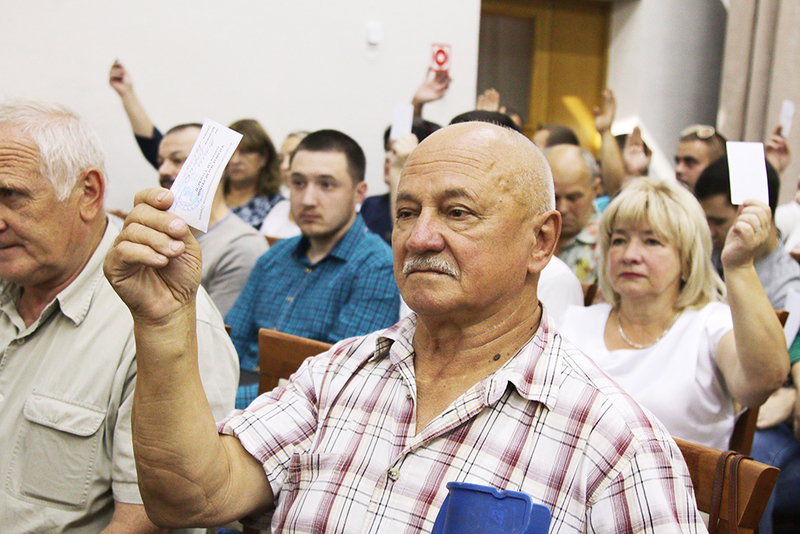 Sergey Cherechen, September 9, took place the 7th congress of Belarusian Social Democratic Hramada in Minsk.